[S3028] E-mail from Philip Paske to Stuart & Teresa Pask dated 22 February 2008: Family Tree. [S2] GRO Indexes to Births. "1927/Q2 BULLEN, Barbara L. BURGOYNE Totnes 5b 219." [S4] GRO Indexes to Deaths. "2010 PASKE, Barbara Lilian 26 May 27 Devon District 4231A Reg 1A023 Ent 035 Dor 0910." [S3] GRO Indexes to Marriages. "1952/Q3 PASKE, Christopher H. = BULLEN, Barbara L. Newton A 7a 1215." [S3872] E-mail from Basil Paske to Stuart & Teresa Pask dated 28 December 2010. [S4999] Website UK Government Probate Search Service: PASKE, BARBARA LILIAN Date of Probate: 01-Nov-2010; Probate No: 3400162; Date of Death: 17-Sep-2010; Document Type: Grant and will; Registry: Bristol. [S2] GRO Indexes to Births. "1956/Q2 PASKE, Basil C. BULLEN Newton A 7a 498." [S3] GRO Indexes to Marriages. "1976/Q1 PASKE, Basil C. = CARR, Diana M. Torbay 21 0285S." [S3028] E-mail from Philip Paske to Stuart & Teresa Pask dated 22 February 2008. [S3] GRO Indexes to Marriages. "PASKE, Basil C = SCHOLFIELD, Elaine R Reg District Torbay 1992 August Volume No 21 Page No 2741." [S4999] Website UK Government Probate Search Service: PASKE, BASIL CHRISTOPHER Date of Probate: 10-May-2013; Probate No: 4064996; Date of Death: 12-Dec-2012; Document Type: Grant and will; Registry: Bristol. [S3] GRO Indexes to Marriages. "1960/Q3 PASKE, Michael F. = LUSCOMBE, Phyllis M. Totnes 7a 1658." Published in the Torquay Herald Express from 17th September 2010 to 24th September 2010. [S2] GRO Indexes to Births. "1963/Q2 PASKE, Lesley A. LUSCOMBE Totnes 7a 983." [S2] GRO Indexes to Births. "1967/Q3 PASKE, Angela June LUSCOMBE Totnes 7a 928." [S2] GRO Indexes to Births. "1955/Q2 CARR, Susan M. BENNETTS Bournemouth 6b 266." [S3] GRO Indexes to Marriages. "1976/Q4 CARR, Susan M. PASKE Torbay 21 1722." [S3] GRO Indexes to Marriages. "1983/Q2 HATTON, Steven C. PASKE Torbay 21 2040." [S4379] E-mail from Katrina Jordan to Stuart & Teresa Pask dated 3 April 2012. HATTON : Stephen Charles (Steve) of Yeovil, passed away peacefully on the 31st July 2011 in Musgrove Park Hospital aged 56 years. A much loved husband, dad, granddad, brother, uncle and friend to many. Funeral service will take place on 15th August, 12.40pm at Yeovil Crematorium. Family flowers only please but donations in memory of Steve for Cancer Research UK may be sent c/o Clive Wakely, Wakely Brothers, 33 Sparrow Road, Yeovil, BA21 4BT. [S2] GRO Indexes to Births. "1955/Q1 HATTON, Stephen J. C. PHILLIPS Newport 88c 291." [S3] GRO Indexes to Marriages. "1983/Q2 PASKE, Lesley A. HATTON Torbay 21 2040." [S2] GRO Indexes to Births. 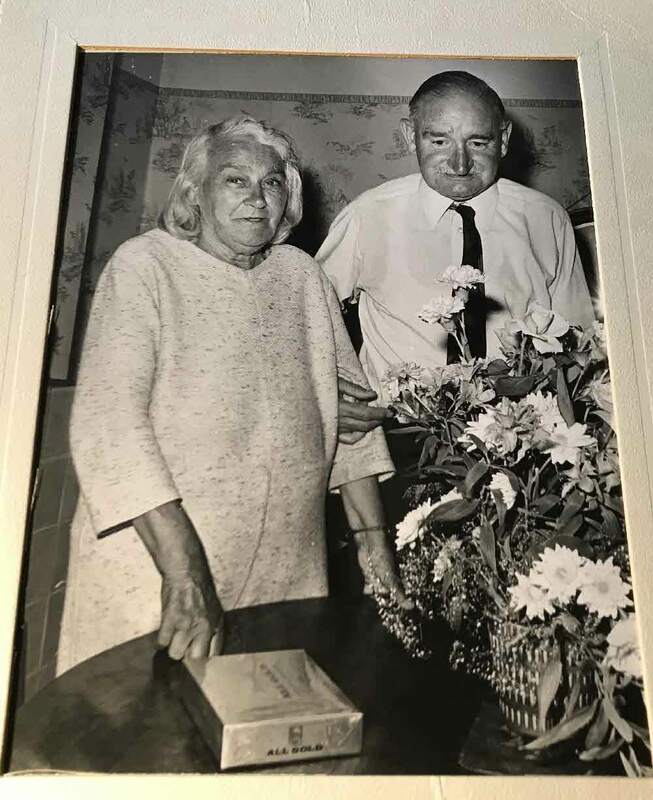 "Nicholas James Hatton Mother's Maiden Surname: Paske Date of Registration: Jan 1986 Registration district: Torbay Registration county (inferred): Devon Volume Number: 21 Page Number: 2021." [S2] GRO Indexes to Births. "Samantha Charlotte Hatton Mother's Maiden Surname: Paske Date of Registration: Mar 1995 Registration district: Yeovil Registration county (inferred): Somerset Register number: A04 District and Subdistrict: 7263A Entry Number: 110." 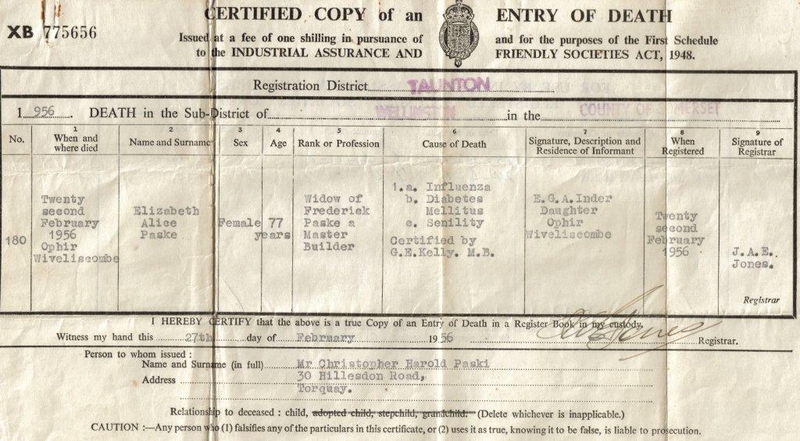 [S3029] Copy of the death certificate of Elizabeth Alice Paske, who died 22 February 1956. Kindly provided by Philip Paske. [S4999] Website UK Government Probate Search Service: PASKE Elizabeth Alice of Ophir House Golden Hill Wiveliscombe Somersetshire widow died 22 February 1956 Probate London 7 April to Edith Gwendoline Alice Inder (wife of Harold Newman Inder). Effects £487 16s 11d. [S2] GRO Indexes to Births. "GRO Online Index: 1903/Q4 PASKE, Edith Gwendoline Alice MOBEY Bristol 6a 143." [S5729] E-mail from Susan Neale to Stuart & Teresa Pask dated 3 February 2018. [S4788] Image of the 1911 Census for Picts Hill, High Ham, Langport, Somerset: RG14 Piece 14323 Schedule 65. [S3] GRO Indexes to Marriages. "1926/Q3 PASKE, Edith G. A. = INDER, Harold N. Clutton 5c 1069." [S5502] Website FindmyPast: 1939 Register: RG101 0799C 008. [S4] GRO Indexes to Deaths. "1956/Q1 PASKE, Elizabeth A. Taunton 7c 310 age 77." [S5729] E-mail from Susan Neale to Stuart & Teresa Pask dated 10 February 2018. [S4] GRO Indexes to Deaths. "1978/Q4 INDER, Edith Gwendoline A. 13 Nov 1903 Warwick & Leamington 31 573." [S4] GRO Indexes to Deaths. 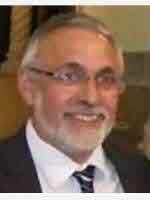 "1988/Q1 INDER, Harold Newman 24 Oct 1904 Taunton Dean 23 1559." [S4999] Website UK Government Probate Search Service: 1988 INDER, Harold Newman of Cedar Ct 24 Stanway Clo Taunton Som died 26 February 1988 Probate Winchester 19 April Not exceeding £70000 8852406860R. [S3] GRO Indexes to Marriages. "1926/Q3 INDER, Harold N. PASKE Clutton 5c 1069." [S2] GRO Indexes to Births. "GRO Online Index: 1904/Q4 INDER, Harold Newman NEWMAN Bristol 6a 117."